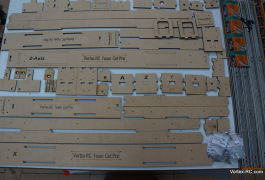 Build a fully functional DIY 4 Axis CNC to cut custom airfoils, fuselages, shapes, letters etc on foam. Cut any one of the thousands of airfoils precisely. Our kit includes precision laser cut interlocking parts that assemble together quickly for a fully functional 4 Axis hot wire CNC system.